The restaurant is located in a historic Excelsior brick building dating from 1886. They’ve got a proper cocktail bar, skilled bartenders, excellent food, and great atmosphere. This place is perfect for upscale lunch, casual dinner, and Sunday brunch. 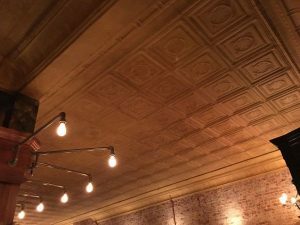 The decor is beautiful and inviting with rustic floors, tall booths, oversized chandeliers, and industrial lighting enhances the look of the exposed original brick. Antiqued mirrored panels set off the white marble design bar top and warm-toned leather bar stools create an inviting space to enjoy Chef Eli’s crafted cocktail menu regionally sourced from such boutique distilleries. 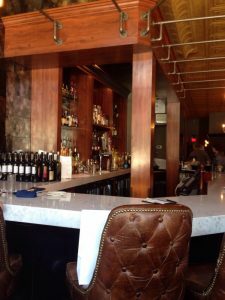 The ambiance is upscale and bistro-like with a very open and vibrant space. The ceilings are cool and there are comfortable leather chairs about. When it is busy, it can get loud. We appreciate all of the locally sourced ingredients and the prices are very reasonable for the quality and portions of food. Complementary: Apparently they give complimentary servings of homemade sugar donuts at brunch. Nothing for dinner. This was an exceptionally flavorful dish to start out with! The Burrata is a semisoft white Italian cheese made from mozzarella and cream. Its outer shell is solid mozzarella, while the inside contains both mozzarella and cream, giving it it’s amazing, soft texture. 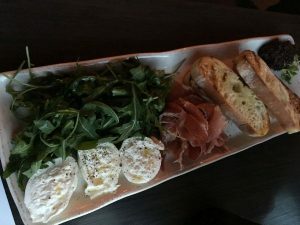 The Prosciutto, jam, and Arugula were fresh and delicious with the toast points! These were just ok… Cooked al dente, with honey, grilled grapes, and a touch of hazelnuts were flavorful, but the cauliflower was the star of the show! I think if we had not had the favorable side of cauliflower, we would have had a different outlook on these because they were good. The grapes added a nice sweetness to the bitter greens. 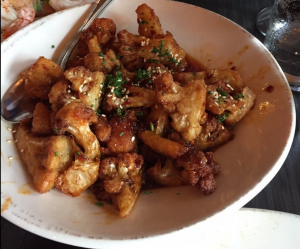 The cauliflower was AMAZING! Cooked until crispy with a sweet chili barbecue sauce, sesame, and green onion. 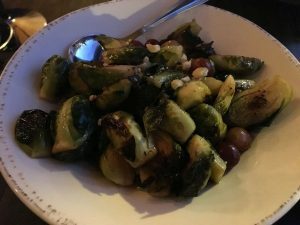 We agreed that we should have ordered two of this dish and skipped the brussels sprouts. This was an outstanding dish! The generous portion of fish was cooked perfectly with a buttered crumb crust. 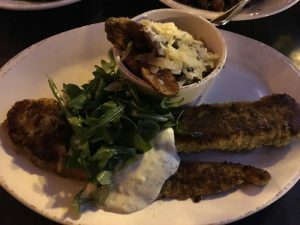 It was flaky and served with a lemon aioli, fresh arugula, and some flavorful, crispy potatoes that had just the right amount of salty cheese. Dessert’s: We skipped it this time but could have eaten the cauliflower as my dessert. 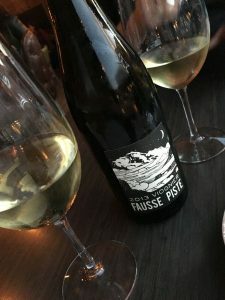 The wine list was decent and we chose a 2013 FAUSSE PISTE, Viognier, $48. The fruit is sourced from high elevation cool climate sites in the Columbia River Gorge and the Applegate Valley. It is a blend of 75% Oregon and 25% Washington fruit. This wine typically sells for just over $20 but was a flavorful choice that was a decent value. Our server was Laura. She was friendly and knowledgeable and did a nice job of taking care of our table. We wish we lived closer because we’ll be back!